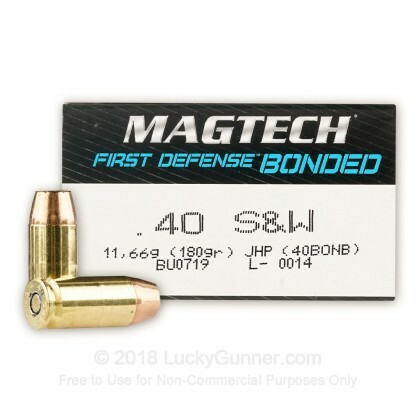 Magtech's 40 S&W bonded JHP ammo is a great choice for self-defense ammo. Geared towards the needs of law enforcement and civilian personal defense, this round boasts a bonded projectile. Bonded projectiles are designed to perform well through various barriers ensuring that the jacket and core remain intact. This results in deeper penetration compared to most non-bonded projectiles when barriers are involved. Magtech ammunition is manufactured in Brazil and is widely sold throughout the world to law enforcement agencies, militaries, and consumers. 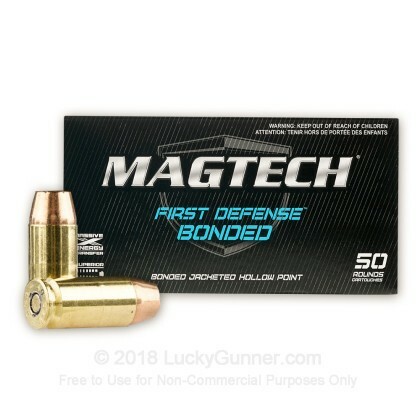 Magtech ammo has gained a strong reputation in the United States over the last number of years as it has become more widely available and consumers have realized what a good find it is. 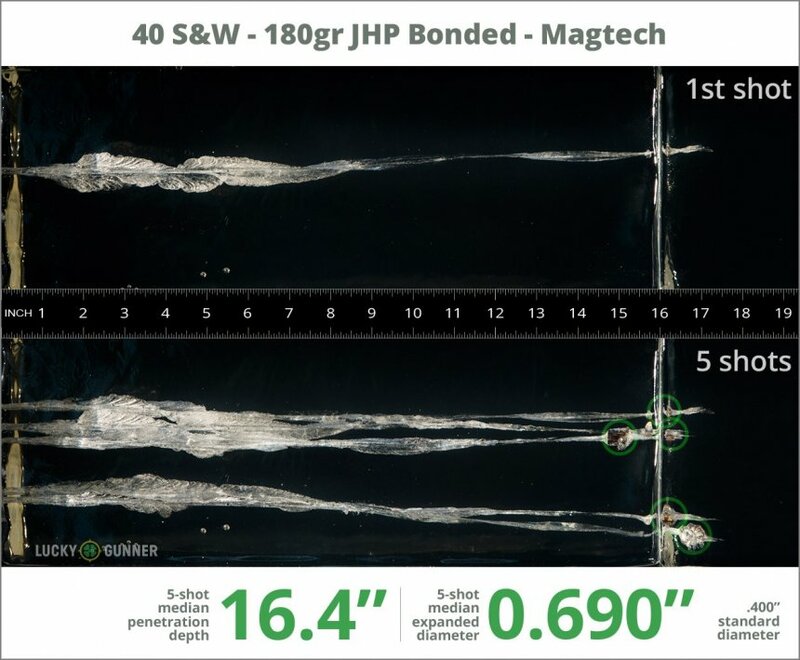 We wanted to know exactly what happens to a self-defense handgun bullet on impact, so following FBI protocols, we fired five rounds of Magtech 180 gr Bonded from 10 feet, through four layers of cloth (to simulate clothing), into synthetic ballistic gelatin. The photos below show the bullets recovered from the gelatin after being fired from a Glock 27 pistol. There’s also a high speed video that shows the bullet impacting the gelatin block. All the data we gathered pertaining to expansion and penetration of this load can be found in the chart below, and the diagrams at the bottom of the page show how it compares to other .40 S&W (Smith & Wesson) self-defense loads from our tests. 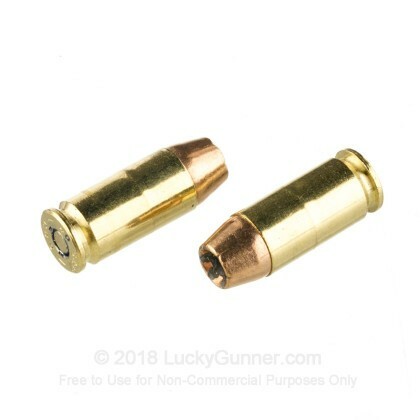 In addition to the .40 S&W (Smith & Wesson) Magtech 180 gr Bonded, we tested over 100 other self-defense loads, so check out Lucky Gunner Labs for the full story. 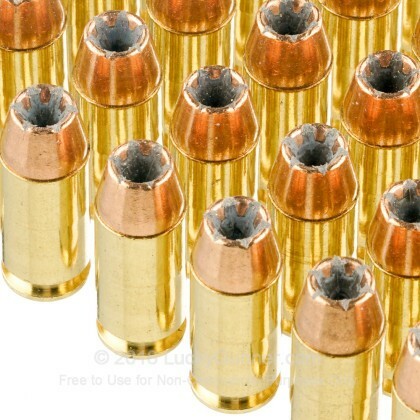 How do the results for this Magtech .40 S&W (Smith & Wesson) compare to other 40 S&W Ammo? 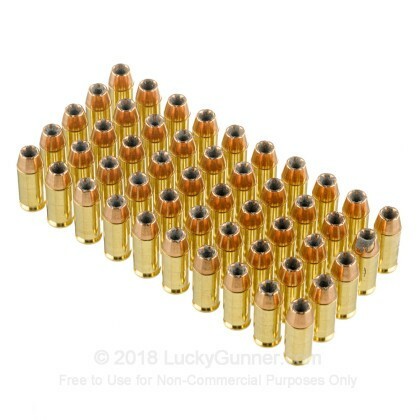 0.89" This ammo: 0.69" Min: 0.39" Median: 0.65" Max: 0.89"
16.4" 0" 9.8" 16.5" 32" This ammo: 16.4" Min: 9.8" Median: 16.5" Max: 32"
We don't have any reviews yet for this particular .40 S&W (Smith & Wesson) ammo from Magtech. 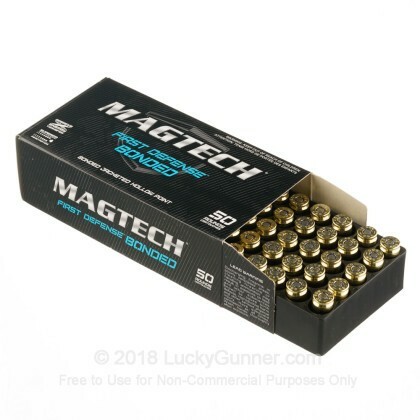 If you'd like to be the first to review this particular .40 S&W (Smith & Wesson) ammo from Magtech, fill out the form below.